ADDA has been present in Tanzania since 2009. During this period, ADDA has implemented two Danida financed projects in Njombe Region with a total funding of approximately USD 2 million, and trained 9,000 small-scale farmers through Farmer Field Schools (FFS). Sunflower was one of the six crops chosen to be the focus of the 246 FFS carried out throughout the project. Furthermore, the projects were focused on market development and value chain development, capitalizing on the increased yields that the farmers experienced after the trainings with a focus on the linkage to the market and ultimately to the consumer. Hence, the farmers were trained in business skills and group management. Vantage Organic Foods (VOF) has been the driving force behind the business idea for this project. Towards the end of the last project, ´NADO in Focus´, VOF contacted ADDA asking for collaboration in order to build up a large base of small scale farmers in Tanzania with the purpose to expand their supply base. Who is Vantage Organic Foods (VOF)? VOF is specialized in procurement and marketing of certified organic animal feed products which are sold on the international market i.e. EU, USA, Canada, Japan etc. VOFs business model is based on the organization, management and certification of small-scale farmers under organic grower group certification schemes as per international organic farming standards. VOF is already working with 30,000 farmers in India, 19,000 farmers in Nigeria and 5500 farmers in Benin other than 14.482 farmers in Tanzania. The model is that the farmers will receive continued yearly training on organic GAP (Good Agricultural Practices), farm management, risk mitigation, post-harvest management etc. through VOF via local service providers. VOF is managing the organic certification process and is organising and paying for the international organic certification. At harvest time VOF will offer to purchase the organically certified crops of the farmers at competitive market prices. The Agriculture Markets Development Trust (AMDT) has been established by the Governments of Denmark, Ireland, Sweden and Switzerland, respectively. A long term facility with a lifespan of at least 10 years. The goal of the Trust is to increase incomes and employment opportunities and sustainable livelihood for poor women, men, and young people in Tanzania. AMDT’s mission is to unleash large scale systemic change in agricultural market systems such that productive poor women, men and youth are able to take advantage of more inclusive, resilient and competitive market systems. 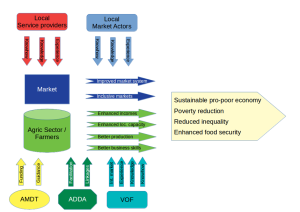 AMDT believes that enabling large scale systemic change targeting market systems critical for the productive poor, in particular, for marginalized women and youth, creates a much stronger chance of achieving sustained pro-poor impact. The activities will be conducted by local service providers and market actors. 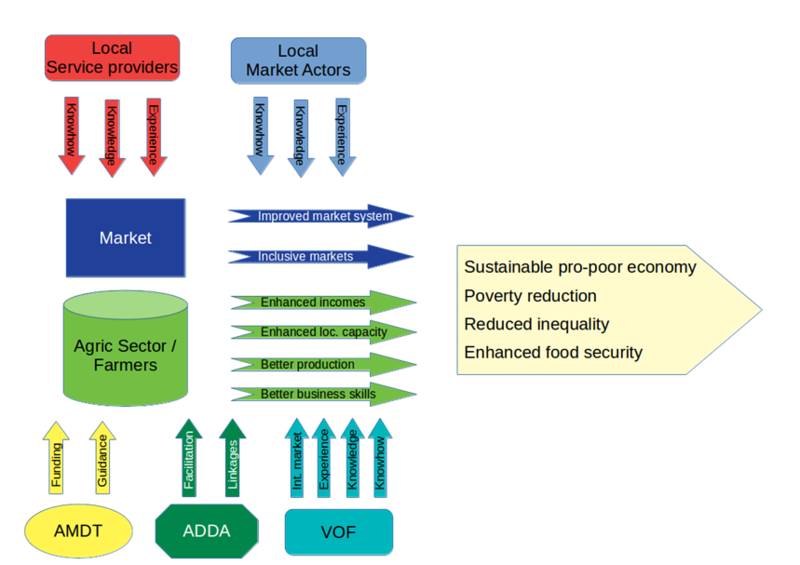 ADDA´s role is to facilitate the linkages and new partnerships between the market actors and assist them when needed in order to build local capacity to catalyse effects and impact. In this way, both farmers and the local market actors will be empowered and strengthened during the project period. During the project period, ADDA will continuously facilitate Training of Trainers (TOT) implemented through local service providers, and teach the local facilitators comprehensive organic farming methods and organic GAP. This will provide the basis for the Farmer Field Schools (FFS), where the knowledge will be transferred to all enrolled farmers with the goal of improving productivity, reducing risks and increasing impact. To facilitate the development of the value chain for sunflower and other oil seed crops in Dodoma and Songwe Regions of Tanzania by implementing a sustainable business model that links at least 20,000 small-scale farmers to the international market for certified organic produce. The project purpose is to improve livelihoods among 20,000 productive poor small-scale farmers and their households by increasing employment opportunities and thereby incomes of vulnerable small-scale farmers living below the official poverty line. This is done by facilitating a process of improving the existing local agricultural market systems by: facilitating a sustainable market linkage to the international market for certified organic produce; facilitating improvements in the competitiveness of market actors in the value chains for sunflower and other oil seed crops; promoting more inclusive growth through M4P and inclusion of women and youth; investing in local capacity building for long-term sustainability. By August 2018, the number of enrolled and certified farmers increased from 4,348 to at least 20,000. By December 2020, organic agricultural productivity and local organisational capacity of at least 5 partnering service providers and the enrolled farmers are increased. By December 2020, the business of the partnering service providers will be economically sustainable. By December 2020, the enrolled farmers sell most of their certified organic sunflower and other organic oil crop produce to VOF at competitive prices. VOF provides a reliable linkage to the international market for certified organic produce. By December 2020, all organic oil seeds sold by the farmers to VOF are processed locally and exported to international markets in EU, USA, Canada, Japan. By December 2020, sustainability in the organic sunflower supply chain is established with continuous training and documentation by the partnering service providers, production by the farmers, purchase by VOF, processing by local processors and export by VOF. If AMDT provides financial support and guidance and if VOF, local project partners, local market actors and service providers contribute with their know-how, knowledge and experience on local context, in organic farming methods, certification and in working with small-scale farmers, connection to farmers as well as providing a market and ADDA facilitates the link between the actors, then this will lead to improved market systems with improved and more inclusive markets, enhanced incomes and local capacity, better production and business skills for farmers and a more sustainable agricultural sector, which ultimately leads to sustainable and pro-poor economic growth, poverty reduction, reduced inequality, and enhanced food security. 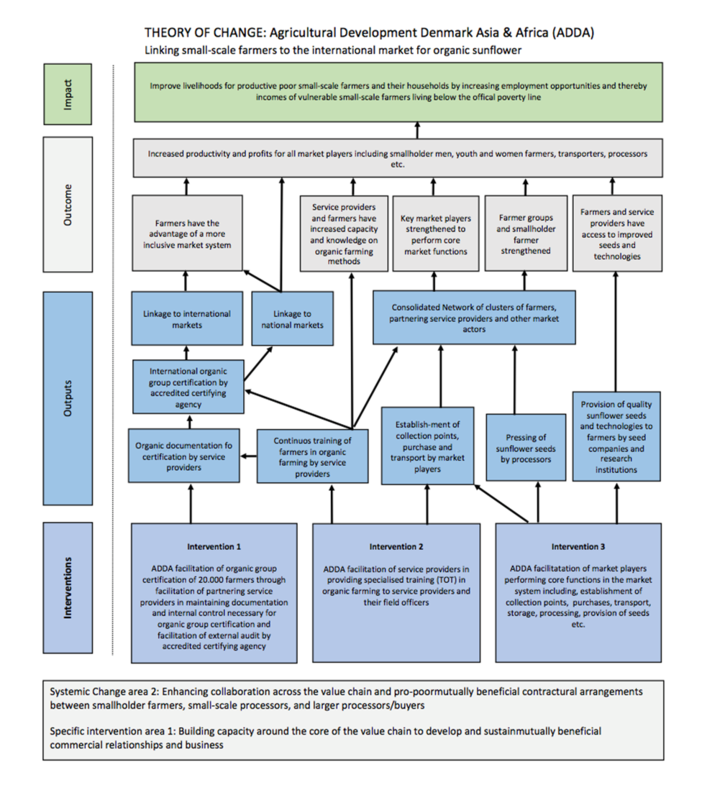 Intervention 1: Facilitation of registration and documentation of 20.000 small scale farmers for organic certification according to international standards. Providing the foundation for a long-term sustainable business model with economies of scale. Intervention 2: Facilitation of capacity building of partnering service providers including TOT. Providing the basis for the Farmer Field Schools (FFS), where the knowledge will be transferred to all enrolled farmers with the goal of improving productivity, reducing risks and increasing impact. Intervention 3: Facilitation of linking small scale farmers, service providers and market actors in order to secure access to the international market for certified organic produce. Afterwards, VOF will offer to purchase the certified crops and sell it on the international market. Because of the training and the increased local capacity. This provides a significantly increased income for the farmers and a result-based income for the implementing partners. 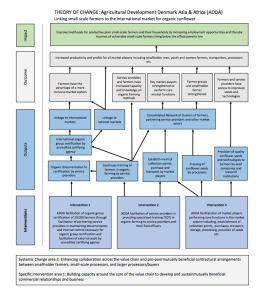 For a graphic overview of the TOC, see the diagrams below. (Click the diagram). At the moment, 14,482 farmers (44% women) have already been registered and have attained organic certification according to international organic standards. Initial basic training have been started. The goal is to reach 20,000 small-scale farmers for registration and organic certification during the 2018 season. To date 14,482 of these farmers have already been registered and 4,348 have already achieved certified organic status. During the lifespan of the project efforts will be put in to attract up to 50% women and encourage youth to enroll under the project. The main partner service provider in Songwe Region (previous part of Mbeya Region) is Actions for Development Programs Mbozi (ADP), which is a formally recognised NGO assisting its member base of small scale farmers with organic registration, training and documentation throughout the project period. The farmers in Dodoma Region have not yet formed formal NGOs or farmer organisations, since initially the main focus has been on finding motivated farmers to be enrolled for organic registration, training and documentation. However, it is ADDAs experience that once they have received FFS training in groups, many continue to stay in the groups and even decide to start up small business together. Furthermore, they often find that the group approach strengthens their voice towards local authorities, local sellers and buyers and other stakeholders. An essential part of the project is therefore that ADDA will encourage and support them in their efforts towards group mobilisation and ultimately building formally registered agricultural farmers’ organisations – based on the motivation and wishes of their members.